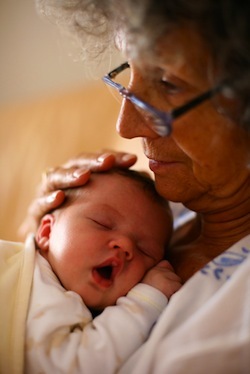 Grandparents and the Delivery Room: Yes or No? You may love your grandma and grandpa with all your heart, but are they the perfect people to have in the delivery room? Before making the final decision, ask these five simple questions. Do both mom and dad want the grandparents in the delivery room? Will the invitation be extended to both sets of grandparents? Are grandmothers and grandfathers being invited? Are there any second thoughts? Once you've answered these questions the rest is simple. Both parents need to agree on the decision and if one set of grandparents is being invited and the other set is close by, not inviting them could cause a problem. Grandmothers have personal experience with labor and delivery, but do you really want grandpa as a part of this intimate event? If family relations between the grandparents and other labor attendees are complicated, don't invite them because you don't need the stress. And, finally, if there are any second thoughts just skip it and worry about your happy day as a couple.